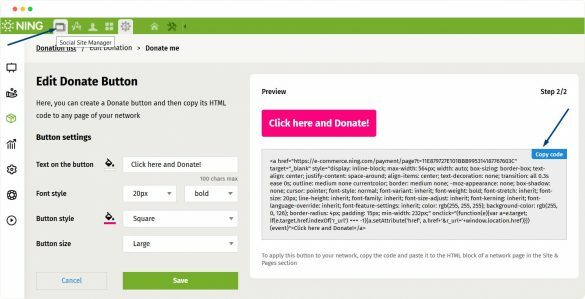 A “Donate” button is one of the simplest yet effective ways to get the attention of all the visitors of your network to your Donation campaign. Once you added a payment method and created a campaign, you will automatically get to the page where you can create a special Donate button. This button will lead directly to the payment page. As you can see at the picture, you can create a button with a customized call-to-action word or phrase that suits your campaign best (Donate, Click here and Donate, Help us, Donate now, etc). You can choose the size, shape, color of the button, as well as write the CAT text with the font you like. You can see the preview of the button in the right block of the page.